There are many ways to make money off a blog and selling ads is one of those. Some people even create blogs with this goal in mind as it’s an entirely viable option and one of the legit ways to earn money. Not all of us enjoy seeing ads and often getting annoyed by them. But being on the other side of the fence and trying to monetize a blog you will have to figure out how to make ads work for you and your visitors. It’s not an easy thing to do, it takes time and hard work to enable your blog to be a suitable ad space. But, don’t get discouraged. If you know what ads to use and how to use them, you can start making money through that vertical. Let’s get into details of selling ads. In a lot of situations, when people start a blog of their own, they want to start monetizing it as soon as possible. The reality is that no matter how enthusiastic you are, it will take some time before you can start making money with blog ads. Unless, of course, you are a big influencer that already has a lot of followers and an established blog that can quickly generate traffic. Even if you do a fantastic job of setting up your blog, it will take time before you can sell ad space and make money this way. Some of the things that are essential for making your blog advertisable include the amount of traffic, the blog’s design, and stability. Without this stuff, you cannot expect that a serious advertiser will be interested in your blog. You will need around 10k unique visitors per month to get on the radar of advertisers. The design should be professional, and your blog should have allocated ad spaces. You also need to have constant traffic so that people will not feel like their money is going to waste. There are different types of ads you can run on your blog, and some approach works better from one case to another. Below we will show you the most popular ads options you can put in place. AdSense is a Google product that lets website owners make money by placing targeted ads on their sites. You as a website publisher get paid per click (PPC) when visitors click on (or view, in some cases) the ads. You don’t have to invest any money or work into it, as the advertiser will put ads on your blog and pay you every time someone clicks on the ad located on your blog. You will have to create an AdSense campaign that revolves around your blog. But, you must be careful with which ads you choose to put on your blog because having irrelevant ads will bring you no results. It’s in your interest to do this right and avoid putting ads that are completely unrelated to your blog or your content. If you are running a fashion blog, it would be a good idea to advertise fashion lines, retailers, and fashion brands. The most frequently asked question and the hardest one to give a definitive answer is – “How much money can I make from AdSense?”. It’s believed that earnings from 1,000 ads impressions are $1 across the global network. In reality, prices paid on AdSense are dynamic and set by auction. 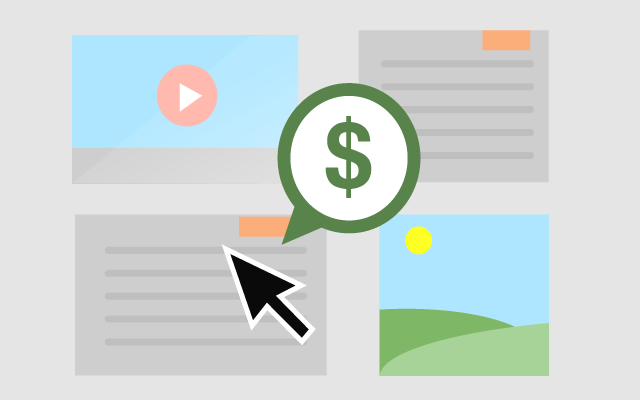 Many websites generate real revenue through AdSense, but you need to try it to find out what you could earn on your site. It’s also important to spend time on optimizing ads you are running to increase earnings potential. Affiliate marketing is one of the best advertising methods a blog can rely on to make money. If you create a blog that offers quality content and has a large base of loyal readers, you will be able to gain their trust. That means that they will value your opinion and be open to taking suggestions from you and your blog posts. Recommended reading: Affiliate Marketing: What is It and How Does It Work? It’s a great opportunity to insert links into your content that lead to some third party services or products. Affiliate marketing works differently than PPC; you get paid based on “cost per acquisition” model. That means advertiser will pay you for a particular action. When a reader clicks on the affiliate link and completes some action, for example, a sale, form submit, or registration, etc. Still, you should not betray your readers because of your affiliate deals and lead them to poor products or services. Don’t insert misleading links that take them somewhere they didn’t expect to end up. On top of that, you need to put links in the right places and make sure that those are valuable to your readers. If you do this, you might get some clicks in the first couple of months and then people will learn their lesson. On top of that, they might stop coming to your blog as well. A good example of affiliate marketing is when you put links that lead to camera equipment in a blog that talks about photography. As you might already know, Amazon is one of the largest online marketplaces. There are many affiliate markets, but for bloggers and companies, Amazon is one of the top choices. First of all, with each product sale that comes through your affiliate link, you can earn up to 10% in advertising fees. It might seem like a small percentage, but it can help you generate a good income. For example, if you are a tech blogger who focuses on brand new gadgets, you can write a lot of reviews for phones, laptops, tablets, etc. After that, add Amazon affiliate links that lead to these products on Amazon. It’s a direct way of giving people information about products they can rely on and provide them with the option to buy these products. Make sure that you choose the correct geolocation for the affiliate program, depending on where your readers are coming from. You can include banners, widgets or links on your site. The Amazon affiliate program is very flexible, and everyone can make money if they do things right. It’s one of the most productive ways of advertising on your blog when it comes to placing ads/renting space for ads. With this method, you are not relying on third parties to create an advertisement. Instead, you are reaching out to advertisers on your own and making a direct deal with them. Here is an example from GaryVee how to sell ads on your blog. That way you will be able to earn more from your ads, but you will need to put some work to find these deals. To get great deals your blog needs to have good reachability and good traffic. Overwise, advertisers, won’t consider placing ads on your website. Sponsored blog posts are articles published by other people on your blog. But in some cases, you will have to write them. You should never accept free sponsored blog posts unless they are from influential bloggers that will make your site shine. In most cases, you will get an article that you can review and publish on your blog. As the owner of the blog, you will also be able to suggest edits or even write a blog post yourself and ask for more money. If you run a blog where you are posting something personal, you will want to make sure that these posts are written with your tone of voice. You should make sure that the post fits your niche and that the topics revolve around your blog’s main subject. In some cases, you will be able to ask for the material you want. You can even take advantage of these posts to fill the gaps you might have on your blog. And create more useful content for your readers while making money. If you have a lot of search engine traffic and your blog is not suited for an affiliate model, Chitika is the right way to go. Chitika is the best alternative to AdSense. If you have a blog that is not quite there yet when it comes to traffic, Chitika has the power to show relevant ads that will be effective. For big blogs, Chitika can be a gold mine, but even smaller ones can start making money from ads on this network. On this system, you can find a lot of different ad types, and it’s easy to create and customize them. The primary domain of Chitika are contextual ads, but there are also highlight ads, hover ads and in-text ads. BuySellAds is one of the largest networks for bloggers to connect with advertisers, and the biggest niche blogs rely on it. But, this marketplace will take 25% of every ad sale that you make. Still, they will make sure that you have no troubles with bookkeeping, payments and ad hosting, as they take care of all these things. Here is the list of over 40 different ad networks. One of the beauties of blogs is that they get a lot of quality leads that can be utilized with various ad strategies. First of all, your blog should talk about topics which are important to people and give them valuable information to solve their problems. That means quality content based on interesting subjects. We’re making it sound easy, but it isn’t, and there isn’t a set in a stone formula that will help you achieve this. Think about questions that people ask, what problems they have, what advice can help them. What you blog about matters, so take your time to find the right topics. You can also go to similar blogs and see what people are talking about over there. Get valuable ideas on what to talk about next, or how to approach a similar topic from a different, but interesting angle. Be consistent with your blog posts and work on sharing them on social networks to increase exposure. Also, make sure to include natural and helpful external links that will lead readers to related content on your blog. Over time, people will start trusting you, and then, you can start leading them to paid ads for which you can earn money. But, you should never compromise your integrity as a blogger for paid ads. Make sure that you lead them to content, products, and services that they have an interest in and offer quality. Remember that your blog and your readers always come first. Work on building up your blog into a serious online presence. Even when you start selling ads, never let those ads reduce the quality of your posts or the experience of your readers. With this attitude, your blog will always be popular and a hot asset for advertising. Best of luck.